Guayaquil is Ecuador's main port and largest city. It is considered the nation's economic capital. The newly completed Malecon is a collection of restaurants, theatres, and parks along Malecon Avenue, which runs parallel to the Guayas River. The Malecon is a sight not to be missed. 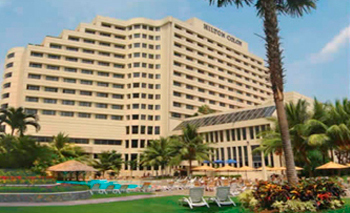 The Hilton Colon Guayaquil stands majestically within the new and booming commercial sector, only five minutes drive from the airport. Presenting a remarkable architectural design, the hotel offers a fascinating panoramic view of the city and an easy access to the downtown financial area. 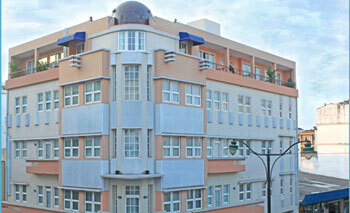 Shopping malls and tourist attractions are only a few minutes away. The Hotel offers the sate of the art meeting rooms and business centre, with all the facilities and services to accommodate the modern executive traveler. 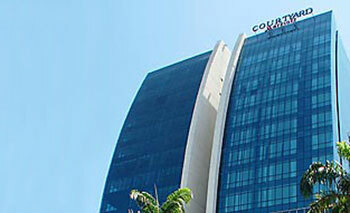 The newest hotel in Guayaquil is the Courtyard by Marriott Hotel in Guayaquil. Located on Avenida Francisco de Orellana, 5 minutes from the airport and top businesses, the Courtyard Hotel offers spacious guest rooms with comfortable beds. The various meeting rooms are perfect for small business meetings or social events. Experience the Mediterranean and national cuisine of the Vitro Restaurant or explore Simon Bolivar's waterfront pier, offering excellent restaurants and shopping. The Mansion del Rio Hotel offers an elegant, relaxing and unique atmosphere, offering comfort and attention to detail not found anywhere else. We are located near the Guayas River in the heart of the oldest district in Guayaquil, just 10 minutes from the touristic and commercial downtown of Guayaquil. The monuments and the river can be seen from every corner of the mansion. The rooms in Mansion del Rio Hotel offer a sense of being in another time period but with the necessary technological advances. Our main room is the perfect place for receptions and banquets. The Oro Verde Hotel is the place where guests experience a winning combination of Swiss expertise and warm Ecuadorian hospitality. Located in the most modern commercial and banking area of Guayaquil, the largest and most dynamic city in Ecuador. The Oro Verde Hotel provides excellent services in a friendly atmosphere and offers all the comfort of an international hotel of the highest standard. 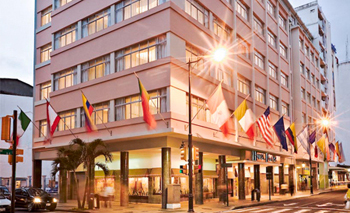 The newly renovated Palace Hotel is conveniently located in Guayaquil's downtown, near the financial district and museums, a short walk from the riverside and only 10 minutes from the international airport. Palace Hotel's rooms are well-equipped, comfortable and welcoming to make guests feel at home. Guests are guaranteed security and the chance to relax after a long day of activities, yet are still only a few steps away from the action found within the heart of Guayaquil. Palace Restaurant offers a generous range of dishes including both national and international cuisine. The Palace Hotel also provides various rooms for meetings and events. The City Plaza provides a new concept of innovative design, state-of-the-art technology and personalized service to make you feel at home. Located in the heart of the historic, commercial and financial center, the City Plaza is designed for the modern traveler and discerning executive. The International Airport José Joaquin de Olmedo is only 10 minutes drive away. In City Plaza's Restaurant, the Humboldt Cafe & Restaurant you can enjoy some of the best national and international cuisine in a warm, elegant environment. The function room provides space for up to 30 people and is equipped with state-of-the-art data processing and media facilities for seminars, conferences, corporate dining or celebrations. 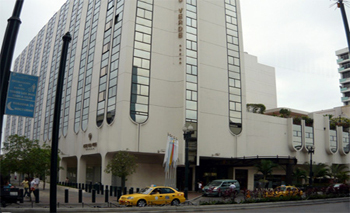 The Macaw Inn is located close to the airport of Guayaquil, near several other large hotels. 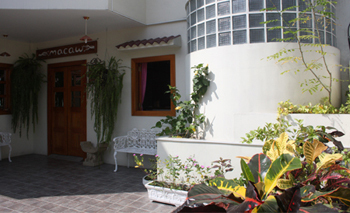 The Macaw Inn is brand new and offers a personal and friendly service. Guests will find pleasant communal areas where they can relax in a comfortable and welcoming atmosphere. Macaw Inn supports the environment by using biodegradable products. 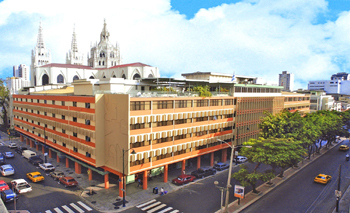 The Grand Hotel Guayaquil is unique; it shares a whole block with the largest and the most spectacular Cathedral in Guayaquil. The Cathedral's spires and impressive stained glass windows adorn the hotel's inner court that includes an inviting pool, a waterfall and a lush 45-foot tall climbing garden. 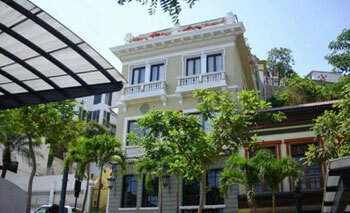 The Grand Hotel Guayaquil has a long tradition of personalized friendly service. The hotel's 182 rooms are generously sized, beautifully decorated and full of amenities, while the restaurants combine local history with tasty cuisine... The Grand Hotel's gym is a 7000 sq. ft rooftop sports complex! Guests can play squash in one of the two courts, relax in a sauna and/or steam room, have a massage, or stretch out on the sun deck with a great view of the Cathedral. And for staying in shape there is an aerobics instructor as well as all the latest training equipment.